Castle Link includes all code for all Castle Link compatible hobby products in one convenient download. Beta and standard releases, including most of the prior versions, are available to users in this bundle. Note: Castle Link software requires a Castle Link USB or Bluetooth Adapter - sold separately - and a computer that is running Windows or an Apple mobile device. Castle Link is compatible with Windows Vista, Windows 7, Windows 8, Windows 10 and the latest iOS. Macintosh desktop or laptop users may take advantage of software such as Parallels Desktop, VMware Fusion, or Apple's Boot Camp along with Windows Vista, Windows 7, Windows 8, or Windows10 to run the Castle Link software, provided the Macintosh has an Intel processor. Macintosh installation is not supported by Castle Creations. 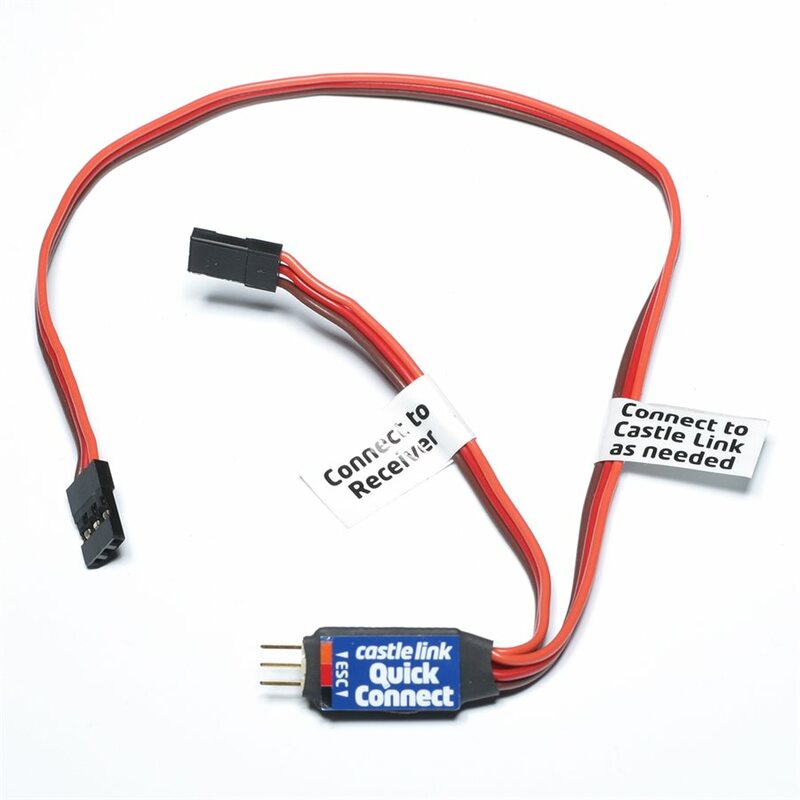 Castle Link™ ESC tuning is an essential component of customization for many of our customers. While our controllers are plug and play, the benefits of fine tuning your Castle ESC through the Castle Link Programming Suite have only reinforced the sophistication and value of the Castle brand. Not only do you get the ability to adjust many variables to enhance your experience, you have the assurance that firmware updates for future features and improvements for your controller are provided at no cost to you. Discover just how easily and quickly you can reign in tuning with the release of the Castle B•LINK™ BLUETOOTH® ADAPTER, which will allow most Castle Link compatible products to be programmed via Bluetooth enabled mobile devices using our free application, with firmware updating to be added soon. The initial release is supported on Apple iOS platforms only; for Android users, a version of the app will be released at a future date, and the B-LINK adapter will be compatible. All current Castle Creations ESCs, many older units and the BEC 2.0 and BEC Pro are supported, for a complete listing of compatible ESCs and accessories please view this PDF file. Program your Castle brushless ESCs and accessories on your Windows® PC with the Castle Link USB programming kit. All-in-one support for all Phoenix, Talon, Thunderbird, QuadPack, DMR, Mamba, Sidewinder, and Hydra controllers, as well as accessories like Telemetry Link, as well as all of our external switching regulators (BECs). *C.H.E.A.T. mode is a feature of the Mamba Max Pro and Mamba X ESCs only. This package includes one Field Link portable programmer specifically made to work with Castle surface controllers, and a USB cable. This package includes one Field Link portable programmer specifically made to work with Castle air controllers, and a USB cable. Experienced modelers go to great pains to tie down their servo and throttle leads, and some find unplugging a Castle controller from the receiver disrupts all their work. Many have asked for something like a Y connector that gives an open lead for easy Castle linking, but a traditional Y harness doesn't work when the other branch of the Y is connected to a receiver - the signal line must be disconnected from the receiver. Quick Connect detects the presence of a Castle Link adapter on the free lead and switches the controller's signal line from the receiver to the Castle Link. Surface - Sidewinder v1/2/3/SCT, Sidewinder Micro, Sidewinder Micro 2, Mamba Micro Pro, Mamba Max, Mamba Max Pro, Mamba Monster, Mamba Monster 2. Air - Phoenix ICE, Phoenix ICE HV, Thunderbird, Phoenix, Phoenix HV. 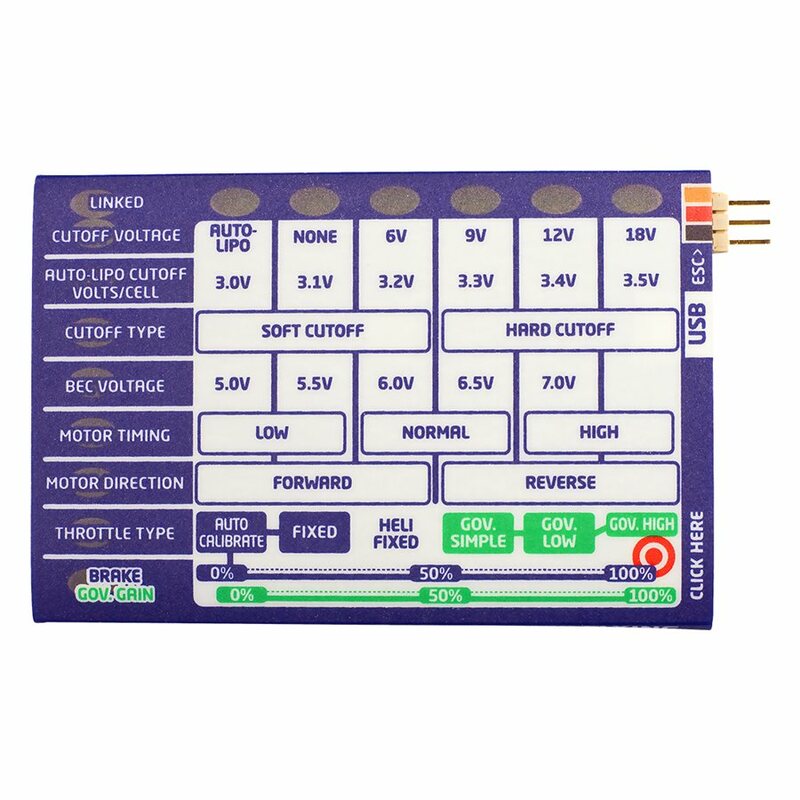 Note: If you have Castle ESCs with AUX wires or an on-board 6+ amp BEC you must use Quick Connect Duo. Note: Neither Quick Connect, nor Quick Connect Duo will work with the Field Programming Cards when used as a standalone programmer. It will ONLY work when using the Field Programming Card as a Castle Link adapter. Quick Connect Duo detects the presence of a Castle Link adapter on the free lead and switches the controller's signal line from the receiver to the Castle Link. 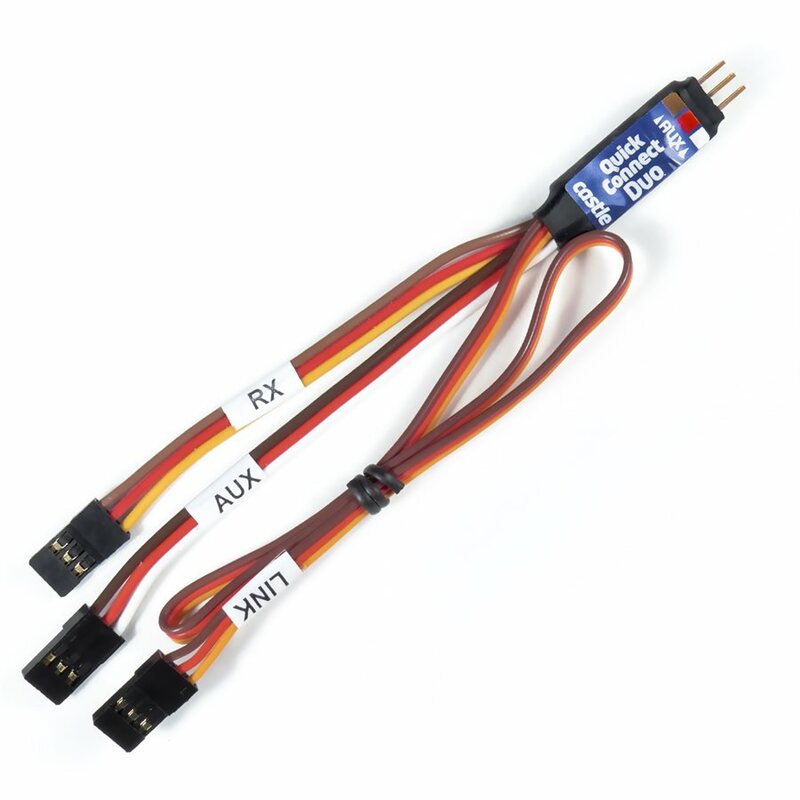 Quick Connect Duo supports all Castle Link capable ESCs but is designed specifically for use with Castle ESCs featuring AUX wire technology. Surface - Sidewinder 8th, Mamba Monster X, Mamba X, Mamba Micro X. Air - Talon, Talon HV, Phoenix Edge, Phoenix Edge HV. Maybe you want to know the voltage of your onboard battery(s), the RPM the motor is turning or the temperature of your ESC. In this day and age R/C is not just one way communication anymore. Traditional radio systems transmit signals from the controller to the receiver, but Telemetry-capable systems also send real-time data from your model back to your transmitter. The X-BUS Telemetry Link was developed based on communication protocol disclosed from Spektrum® for use with specific Spektrum® radios and compatible Castle Creations ESC’s. Telemetry data can be displayed on the transmitter screen, or notify you when a defined threshold is exceeded, (battery voltage, ESC temperature, etc.) you can configure a vibration or sound alert from the radio. Let’s start from the beginning. Telemetry has the potential not only to improve the safety of our models by monitoring battery voltages, ESC temperature, and other critical parameters, but it also creates other opportunities to get even more fun out of flying because it essentially reduces the risk of “unknown” inevitable crashes. Think of the benefits to be had from alarms that will sound to warn you if your ESC is running hot or if your receiver battery is running unexpectedly low.